Winter time spent in sunny Italy can become a magical period, especially if you visit the country during Christmas. The Christmas season in Italy kicks off on December 8th, the Day of the Immaculate Conception. It´s also when the decorations, lights and Christmas trees are set up. Especially impressive trees and decorations can be found in main piazzas all over the country. A huge Christmas tree is set up in the magnificent setting of the Piazza del Duomo in Florence. The lighting up of the Christmas tree is accompanied by an official public ceremony with the participation of Florence’s Mayor as well as other events, concerts and entertainment. In Florence, in Piazza del Duomo you’ll find one of the most impressive Nativity scenes, in Italian Prespi. The Nativity has life-size beautiful statues made in terracotta, famous in the villages neighboring Florence. Check out our intensive Italian courses in Florence and get 5% discount. In Milan’s festive season starts one day earlier, on 7 December, when the fashion capital celebrates the feast of Sant’Ambrogio, the city’s patron saint, a uniquely Milanese tradition. One of the most important and traditional Christmas markets “oh Bej Oh Bej“ is held in Milan from 7 December (day of until the following Sunday). The fair is also informally known as the Fiera di Sant’Ambrogio, to the name of the patron saint. If you would like to study Italian in Milan, have a look at our special offer. The beginning of December in Italy will enchant you, when the holiday vibration is perceived: bagpipers play Christmas melodies all around, and Babbo Natale (the Italian version of Santa Claus) spreads holiday cheer and give candies to the children. In Genoa takes place one of Italy’s most unusual Christmas markets. Held throughout December in the town´s historic centre, the annual market is completely themed on the medieval era. The main square in the historic centre is transformed into a medieval village, where more than 100 artisans and craftsmen dressed in medieval clothes, sell local products including wine, cheese, meats and handmade crafts. The visitors are entertained by shows such as dancing, choirs, medieval storytelling and musical performances. If you haven´t visited Italian Riviera yet, book your flight to Genoa along with you intensive Italian course and enjoy your stay to the fullest! All this festive joy and magical atmosphere leads finally to the Christmas Eve dinner. It traditionally excludes meat items and is based mainly on fish.. sometimes as many as seven different fish dishes are served! Some people attend the midnight mass, worth to mention is of course the one delivered by the Pope in the Vatican City. If you want to see it, don´t forget to book tickets well in advance! 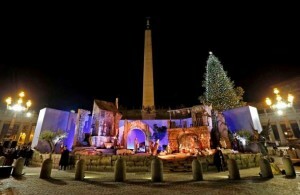 There’s a huge Christmas tree in St. Peter’s Square and a life-sized Nativity scene in front of the basilica. There are more than 100 Nativities in Rome, most of them in Piazza del Popolo, the Piazza Navona turns into a Christmas market and Christmas Eve mass is held in historic churches throughout the city — including the Pantheon. Visiting Rome in winter, do not forget to book your Italian intensive course with us! On Christmas Day, Italians invite their family and friends for a large lunch that usually goes on all day. On this day meat is permitted, and the families serve traditional dishes like pasta in brodo (pasta in broth), roasts and traditional desserts where panettone occupies a special place. 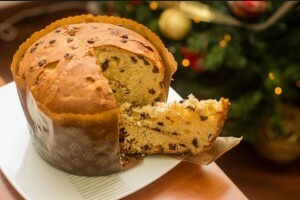 Panettone is a sweet Christmas bread with candied fruit, originated in Milan and is a staple across Italy at Christmas. On December 26 the celebration persists with the national holiday of Santo Stefano; families get together again and eat leftover Christmas dishes and sweets. The official end of the Christmas season is on January 6th, the Day of the Epiphany. It is also the day when the Italian children get their gifts. 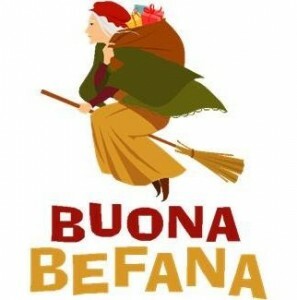 It´s not Santa Claus nor St Nicholas in charge of distributing present to all the childer in the country, it´s an old lady travelling on a broom called La Befana, beloved and awaited by all small ones. She arrives with with toys and sweets for the good children and lumps of coal for the bad ones. After January 6, you’ll see Christmas markets close and decorations start to come down.